The Church Fathers dwelt at length on the mystery of the “opened side” of Christ, often declaring that the Church was born from it as Eve was from Adam’s side. By the early Middle Ages, it had become common for theologians to further reverse the flow, so to speak, writing eloquently of entering into Christ’s loving Heart via the wound in His side: “There is a safe and sure rest for weak and sinful men in the wounds of the Saviour. I dwell in them secure; the interior of His heart lies open to me through the wounds. Whatever is wanting to me, I take for myself from the heart of my Lord; for His mercies are overflowing, nor are holes lacking by which they may flow out. Through the holes in the body appear to me the secrets of the heart; there appears the great mystery of His love, the mercy of our God in which the Orient from on high has visited us.” (Hugh of St. Victor, De Anima, Lib. IV, XXI: PL 177, 181). This mystical interplay had produced the Church; but the Church was not to be taken to be a merely spiritual, invisible body. Constantine the Great had legalised and favoured her, being acclaimed a Saint as a result. His later successor, Theodosius the Great, received similar treatment, partly in tribute to his making Catholicism the State Church of the Empire and baptism entrance into Roman citizenship. Although the Empire was tottering politically as Germanic tribes set up their kingdoms within its shrinking boundaries, the concept of Christendom — a political polity enfolding all who claimed to be followers of Christ — had emerged. Such figures as Justinian and Charlemagne who attempted to restore the Empire were not trying to breathe life into the realm of the pagan Caesars, but to give this Christendom concrete and effective reality. The cultus of the Military Saints — loyal soldiers who nevertheless accepted martyrdom rather than apostasise, or later warriors who fought the external enemies of the True Faith — arose, and their sacrifices were identified with of Christ; they too had laid down their lives for their friends. The Holy Roman Emperor was a canon of both St. Peter’s Basilica and Aachen Cathedral; the King of France enjoyed the same privilege at St. John Lateran and various other churches in his realm; and the King of Spain at St. Mary Major. Even the King of England was an honorary monk of St. Paul’s Outside the Walls (whose abbot was in return prelate of the Order of the Garter) and a canon of St. David’s Cathedral in Wales. Imperial and Royal monasteries and parishes abounded, each ruler’s court had an official chaplaincy, and all of them were expected to participate publicly at the liturgy of such feast days as the Epiphany, Maundy Thursday, Good Friday, and Corpus Christi. Each court evolved its own type of spirituality — and foremost in each was the notion that a sovereign must be willing to sacrifice himself for his subjects, as Christ did for His. The greatest sovereigns were also accounted the most pious — both on their own behalf, and that of their peoples. On June 17, 1689, St. Margaret Mary Alacoque received another revelation from Our Lord, which she described thusly: “so He wants, it seems, to come with pomp and magnificence into the houses of princes and kings, to be honored as there as He has been outraged, despised and humiliated by His passion; He would receive much pleasure by seeing the great men of the earth lowered and humbled before Him, as He felt the bitterness of being abased by them. And these are the words that I heard on this subject: ‘Make it known to the eldest son of my Sacred Heart, that as his temporal birth was obtained by devotion to the merits of My Holy Childhood, so he will get his birth to eternal glory by the consecration which he will make of himself to my adorable Heart, which means his triumph, and through it, to the great of the earth. I want My Heart to reign in his palace, to be painted on his standard and engraved in his arms, to make him victorious over all his enemies, and by placing at his feet these proud foes, to make him victorious over all enemies of the Holy Church.’” This request was sent to the King’s confessor. Although quite familiar, as we have seen, with the concept of national consecration, Louis XIV did not perform it — nor, indeed, did his great grandson and successor, Louis XV. But as the 17th and 18thcenturies wore on, despite the heated opposition of Jansenists and “Enlightenment” partisans, devotion to the Sacred Heart grew. Bishops consecrated their own dioceses to it, as the City Council of Marseilles did, offering an annual solemn procession in thanksgiving for the cessation of the plague of 1722 (as with the Vow of the Assumption this practice has continued ever since, save during the Revolution). From the Jesuits and the Sisters of the Visitation, the Sacred Heart devotion leapt from order to order. But as St. Margaret Mary had written to Louis XIV, Jesus Himself wanted homage to His Sacred Heart to be made visibly on the part of the leaders of the various nations. Fortunately, if Louis himself was reluctant, many others were not. 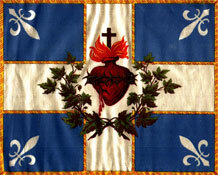 Moreover, news of the Sacred Heart devotion began to trickle into Royal circles outside of France. In 1717, the Visitation sisters settled in Vilnius, Lithuania, and attracted the favor and support of Augustus II “the Strong,” Elector of Saxony, King of Poland, and Grand Duke of Lithuania (whose capital Vilnius was and is). They roused his interest in the “new” devotion, and in 1726 the King wrote Pope Benedict XIII, asking him to support the Sacred Heart veneration and reparation. After Napoleon’s defeat at Waterloo, it appeared that the genie of Revolution had been thrust back into its bottle. The Restoration saw the Monarchs back upon their thrones, and such measures as the Holy Alliance put in place to keep them there. Not surprisingly, in this period of peace, devotion to the Sacred Heart spread ever further throughout Europe. Louis XVIII and then Charles Xwere called upon to consecrate France publicly and fulfill Louis XVI’s vow. But they did not. In July of 1830, the very pious Charles X was deposed, and a new wave of revolutions hit Europe. His usurping successor, Louis Philippe, would not even consider it — and was deposed himself in 1848, as a new and far worse rash of rebellions spread across the continent. In 1875, during the course of the Third Carlist War, the Carlist claimant to the Spanish Throne, Carlos VII, consecrated his ancestral realm to the Sacred Heart. Carlism was always devoted to the Sacred Heart, and its adherents added the image to both the arms and flag of Spain — again, in keeping with St. Margaret Mary Alacoque’s revelation. The 1920s saw continued growth of devotion to the Sacred Heart, most especially enthronement of its images in private homes and other devotions. At the same time, devotion to Christ the King grew, culminating in Pius XI’s 1925 encyclical, Quas Primas. This established the Feast of Christ the King (whose processions would become a rallying point against N*** tyranny in Germany), and made “Long Live Christ the King!” a shorthand code for all who upheld the Catholic social order against any opposition. Pope Pius made recitation of the Act of Dedication of the Human Race an integral part of the observance. It was little surprise that invocation of their Divine Sovereign was constantly of the lips of the Cristeros and the Spanish Nationalists. Saint Paul says: “For I determined not to know any thing among you, save Jesus Christ, and him crucified” (1Corinthians 2:2). This sounds less complicated.